Barcelona were in action against Huesca on Saturday, and coach Ernesto Valverde opted to rotate his squad with Man Utd on Tuesday in mind. It resulted in a rare start for talented youngster Riqui Puig, with the 19-year-old only making one previous appearance all season for the senior side which came in the Copa del Rey. 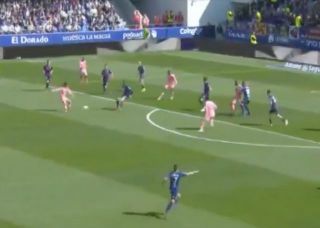 He didn’t disappoint, as he showed a glimpse of what he’s capable of with a delightful reverse pass to put Ousmane Dembele in behind the Huesca defence, but unfortunately he couldn’t apply the finishing touch as seen in the video below. Nevertheless, the pass from Puig was deemed good enough to warrant a tweet from the official Barcelona account, and it’s fair to say that not only are the club excited about what this starlet could offer in the years ahead, but the fans certainly are too based on the responses below. While there is undoubtedly no need to pile the pressure on him or to disrespect Andres Iniesta given Puig has yet to achieve anything close to what he accomplished at Barcelona, many did point out the similarity in the style of passing between the two and it’s a promising sign of what’s to come. Time will tell though if Valverde continues to give Puig opportunities to impress at senior level, as the danger is with the quality in the squad, Puig finds himself with limited chances to play and has to consider an exit from the Nou Camp for a more prominent role. Best players: Rigui Puig, Dembele. Puig, it’s future Iniesta.